Waterproof dive tables for charting depth and time. U.S. Navy standard Air Decompression Table, 40-190 foot. Convenient lanyard hole to attach card to your gear keeper. 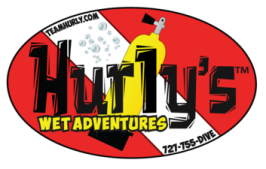 Your depth, and the number and depth of your dives you made in a series are two major factors that determine the length of time you can stay underwater. 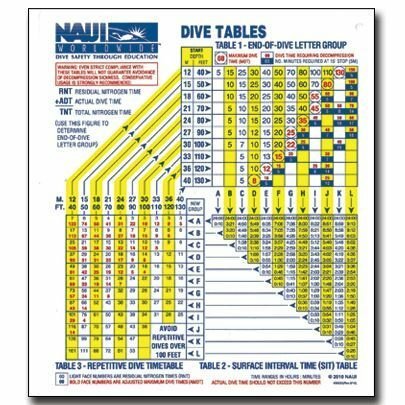 The NAUI Air Dive Table is a great tool which uses a Letter Group designation to express the amount of residual nitrogen in your body. 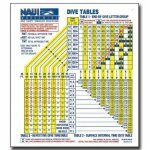 The NAUI Air Dive Table acts as an efficient instrument essential to plan dives with correct time and depth limits necessary to dive in a safe and competent manner. With its waterproof and conveniently hole-punched features, this table is suited for any occasion and fitting for any travel destination plans.